Unless you have had your head in the sand for a few days, it’s impossible to have missed the quite staggering amount of drama that the celestial steed has generated. There have been people threatening to cancel their accounts right through to this gem of a post. The micro transactions have been around for a few months now albeit only in the form of pets. Evidently the introduction of mounts to the system is clearly more offensive to a certain segment of players. 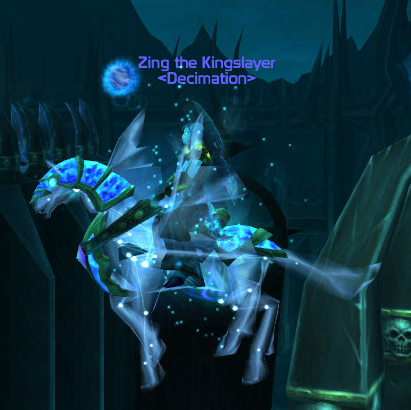 I have always collected pets and mounts and prior to the Blizzard pet store, I used to chase the TCG offerings. I’ve bought every single one of the in game vanity items currently available from the store. I’m honestly amused and somewhat perplexed by the flaming regarding the Blizzard Pet Store. If they were selling epics or items that were offering players a distinct advantage in game then yes, I could entirely understand the objection. They’re selling fluff items that some players (and not all) feel enhance their game play. There are literally hundreds of pets and mounts available in game. 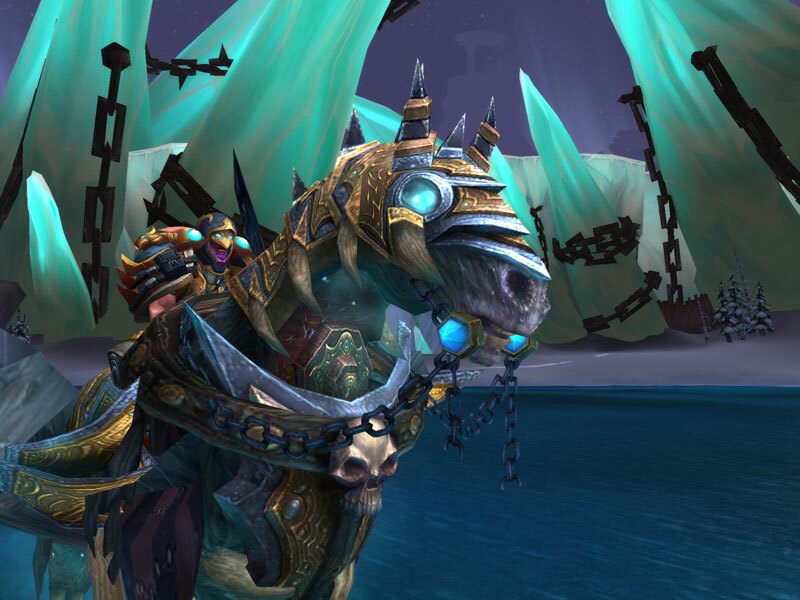 Their sources vary from extremely hard PvE content (such as Invincible and Mimiron’s Head) through to reputation based rewards, PvP grinding and simple gold layouts. The related achievements, Lil’ Game Hunter and Mountain O Mounts can be obtained without the need to spend your hard earn, real life, money also. Should they add another tier to the pet achievement (which seems obvious) requiring 100 vanity pets collected, you can still reach it easily. 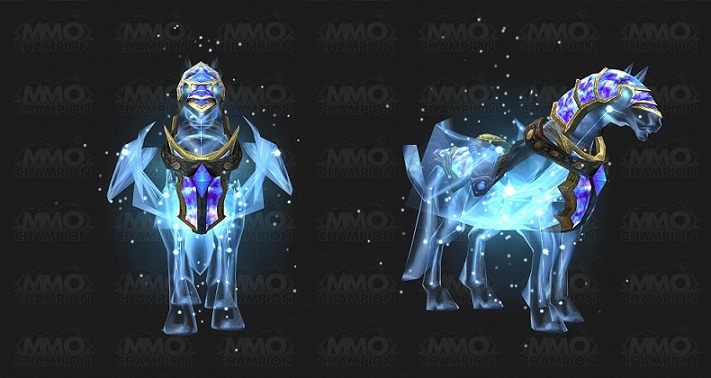 To the people arguing that the celestial steed is one of the more visually appealing mounts to have been implemented recently, I say one word; Invincible. I will never own Invincible. I am part of a ten man strict guild and Blizzard, in their wisdom, have decided that such mounts should only be rewards for twenty five man content (this is another argument entirely). It’s my choice however to be a ten man raider and forgo such potential rewards. In the same way it is another’s choice to spend £17.00 on the celestial steed. Simply put, no one is forcing you to spend any money, aside from the required subscription free, on addition vanity items. For those that do, is it honestly such a huge deal to you personally? 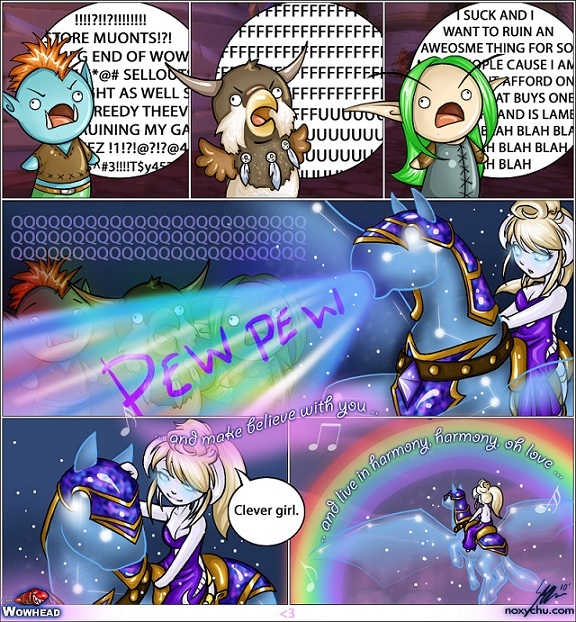 Wowhead produced an amazing comic based around exactly this subject base and in lieu of time today to finish the post I had intended, I’m reproducing it here. 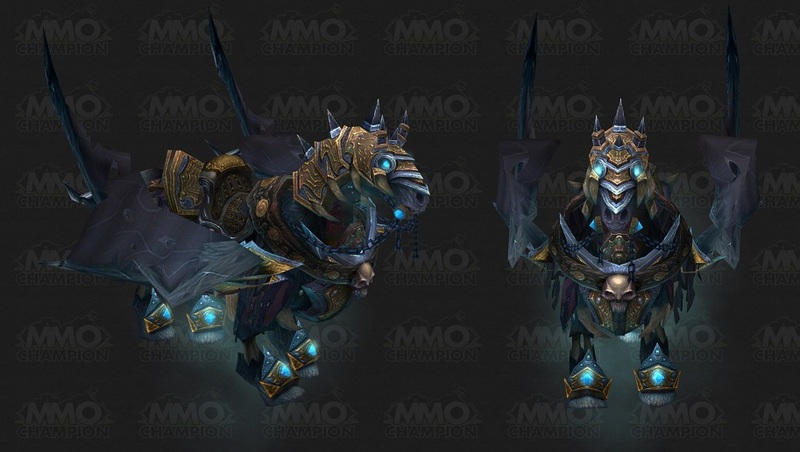 When patch 3.3.3 was on the PTR, a couple of new mount and pet models were data mined from the files. While the location of some of these became apparent, the amazing Celestial Steed was still a mystery. Many speculated that he would drop from the boss in Ruby Sanctum, but as I posted at the time, I couldn’t see how the model fit well with the setting of the instance. Today the source of the mount has become clear. It is to be added in the latest round of micro transaction pets and mounts available from the Blizzard store (albeit it, this is the first mount to be sold). The speed of the mount depends upon your current in game mounts. If you have earned a 310% mount already, then this guy will be the same speed. For those who haven’t, he’s a 280% speed flying mount. If you haven’t yet seen his in game animation, you can find a video here. In addition to the celestial steed, the Lil’XT pet will also be added to the pet store. There’s no word yet as to when these guys will appear for sale nor the price of either of the collectibles. The final news I feel is worth mentioning today is directed specifically at any mount collectors out there. When the files for patch 3.3.3 began to trickle through, many will remember a couple of new mounts being data mined. One of these was the X 53 Touring Rocket – a multi-person flying mount. 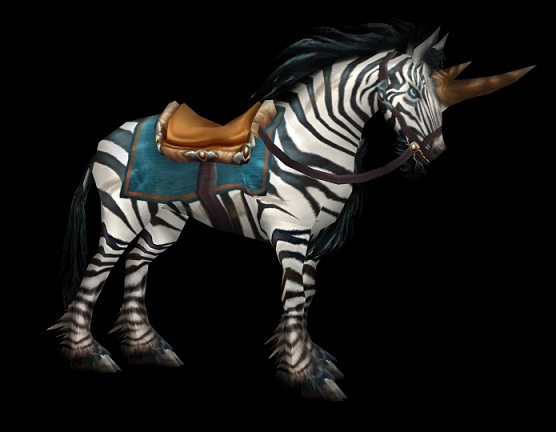 A blue poster today confirmed that this mount will be the new reward for the recruit-a-friend program. It’s also worth noting that this is a 310% speed mount if you have already earned the equivalent speed in game.